Mary II (April 30, 1662 – December 28, 1694) reigned as Queen of England and Ireland from February 13, 1689, and as Queen of Scots (as Mary II of Scotland) from April 11, 1689 until her death. Mary, a Protestant, came to the thrones following the Glorious Revolution, which resulted in the deposition of her Roman Catholic father, James II. The Glorious Revolution represented an important step in the creation of a more democratic state and the resolution of the religious struggles which had plagued Europe since the Protestant Reformation. Mary reigned jointly with her husband and first cousin, William III, who became the sole ruler of both countries upon her death in 1694. Popular histories usually refer to the joint reigns as those of "William and Mary." Mary, although a sovereign in her own right, did not wield power during most of her reign, instead ceding it to her husband. She did, however, govern the realms when William was engaged in military campaigns abroad. Mary, born at St. James Palace in London on April 30, 1662, was the eldest daughter of James, Duke of York (the future James II of England) and of his first wife, Lady Anne Hyde. Mary's uncle was King Charles II; her maternal grandfather, Edward Hyde, 1st Earl of Clarendon, served for a lengthy period as Charles's chief advisor. Although her mother bore eight children, only Mary and her younger sister Anne survived into adulthood. At the age of 15, Princess Mary became betrothed to the Protestant Stadtholder, William, Prince of Orange. William was the son of her aunt, Mary, Princess Royal, and Prince William II of Nassau. At first, Charles II opposed the alliance with a Dutch ruler—he preferred that Mary marry the heir to the French Throne, the Dauphin Louis—but later, under pressure from Parliament and with a coalition with the Catholic French no longer politically favorable, he approved the union. Pressured by Parliament, the Duke of York agreed to the marriage, falsely assuming that it would improve his popularity among Protestants. The first cousins Mary and William married in London on November 4, 1677; Mary reportedly wept throughout the ceremony. Mary went to the Netherlands, where she lived as William's consort. Although she was devoted to her husband, the marriage was often unhappy; her three pregnancies ended in miscarriage or stillbirth, and her childlessness would be the greatest source of unhappiness in Mary's life. Her animated and personable nature made her popular with the Dutch people, but her husband was often cold and neglectful, and long maintained an affair with Elizabeth Villiers, one of Mary's ladies-in-waiting, though over time he became more relaxed in Mary's company. Upon the death of Charles II without legitimate issue in 1685, the Duke of York became king as James II in England and Ireland, and as James VII in Scotland. He had a controversial religious policy; his attempt to grant freedom of religion to non-Anglicans was not well-received, as the technique he chose was to annul acts of Parliament by royal decree. Several Protestant politicians and noblemen entered into negotiations with Mary's husband as early as 1687. After James took the step of forcing Anglican clergymen to read the Declaration of Indulgence—the proclamation granting religious liberty to dissenters—from their churches in May 1688, his popularity plunged. Alarm amongst Protestants increased when his wife, Queen Mary, gave birth to a son—James Francis Edward—in June 1688, for the son would, unlike Mary and Anne, be raised a Roman Catholic. Some charged that the boy was "supposititious," having been secretly smuggled into the Queen's room in a bed-warming pan as a substitute for her stillborn baby. Although there was no evidence to support the allegation, Mary publicly challenged the boy's legitimacy, sending a pointed list of questions to her sister, Anne, regarding the circumstances of the birth. On June 30, the Immortal Seven secretly requested William—then in the Netherlands with Mary—to come to England with an army. At first, William was reluctant; he was jealous of his wife's position as the heiress to the English Crown, fearing that she would become more powerful than he was. Mary, however, convinced her husband that she did not care for political power, telling him "she would be no more but his wife, and that she would do all that lay in her power to make him king for life." William agreed to invade and issued a declaration which referred to James's new-born son as the "pretended Prince of Wales." He also gave a list of grievances of the English people and stated that his proposed expedition was for the sole purpose of having "a free and lawful Parliament assembled." The Dutch army finally landed on November 5, having been turned back by a storm in October. The disaffected English Army and Navy went over to William, and the English people's confidence in James stood so low that they did not attempt to save their king. On December 11, the defeated king attempted to flee, but was intercepted. A second attempt at flight, on December 23, was successful; James escaped to France where he lived in exile until his death. Mary was upset by the circumstances surrounding the deposition of her father, but William ordered her to appear cheerful on their triumphant arrival in London. As a result, she was criticized for appearing cold to her father's plight. James, too, wrote a diatribe against her criticizing her disloyalty, an action which deeply affected the pious Mary. In 1689, a Convention Parliament summoned by the Prince of Orange assembled and much discussion relating to the appropriate course of action ensued. William of Orange felt insecure about his position; he wished to reign as a king, rather than function as a mere consort of a queen. The only precedent for a joint monarchy dated from the sixteenth century; when Queen Mary I married the Spanish Prince Philip, it was agreed that the latter would take the title of king. But Philip II remained king only during his wife's lifetime, and restrictions were placed on his power. William, however, demanded that he remain king even after his wife's death. Although some prominent statesmen proposed to make her the sole ruler, Mary, remaining loyal to her husband, refused. On February 13, 1689, Parliament passed the Declaration of Right; it deemed that James, by attempting to flee on December 11, 1688, had abdicated the government of the realm, and that the Throne had thereby become vacant. Parliament offered the Crown not to James's eldest son, James Francis Edward (who would have been the heir-apparent under normal circumstances), but to William and Mary as joint sovereigns. It was, however, provided that "the sole and full exercise of the regal power be only in and executed by the said Prince of Orange in the names of the said Prince and Princess during their joint lives." The declaration was later extended to exclude not only James and his heirs from the throne, but all Catholics, since "it hath been found by experience that it is inconsistent with the safety and welfare of this Protestant kingdom to be governed by a papist prince." The Bishop of London, Henry Compton, crowned William and Mary together at Westminster Abbey on April 11, 1689. Normally, the Archbishop of Canterbury performs coronations, but the Archbishop at the time, William Sancroft, although an Anglican, refused to recognize the validity of James II's removal. On the day of the coronation, the Convention of the Estates of Scotland—which was much more divided than the English Parliament—finally declared that James was no longer King of Scotland. William and Mary were offered the separate Scottish Crown (the two kingdoms were not united until the Acts of Union in 1707); they accepted on May 11. Even after the declaration, there was still substantial support for James in Scotland. John Graham of Claverhouse, Viscount of Dundee raised an army and won a convincing victory at Battle of Killiecrankie on July 27. The huge losses suffered by Dundee's troops, coupled with his fatal wounding at the start of the battle, served to remove the only effective resistance to William and the uprising was quickly crushed, suffering a resounding defeat the next month at the Battle of Dunkeld. In December 1689 Parliament passed one of the most important constitutional documents in English history, the Bill of Rights. This measure—which restated and confirmed many provisions of the earlier Declaration of Right—established restrictions on the royal prerogative; it declared, among other things, that the sovereign could not suspend laws passed by Parliament, levy taxes without parliamentary consent, infringe the right to petition, raise a standing army during peacetime without parliamentary consent, deny the right to bear arms to Protestant subjects, unduly interfere with parliamentary elections, punish members of either House of Parliament for anything said during debates, require excessive bail, or inflict cruel or unusual punishments. The Bill of Rights also addressed the question of succession to the Throne. Following the death of either William III or Mary II, the other was to continue to reign. Next in the line of succession would be any children of the couple, to be followed by Mary's sister, Anne, and her children. Last in the line of succession stood any children William III might have had from any subsequent marriage. From 1690 onward, William often remained absent from England, at first fighting Jacobites in Ireland. While her husband was away, Mary administered the government of the realm. She proved a firm ruler, ordering the arrest of her own uncle, Henry Hyde, Second Earl of Clarendon, for plotting to restore James II to the throne. 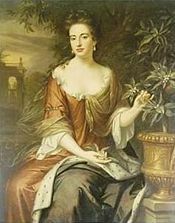 In 1692 she dismissed and imprisoned the influential John Churchill, First Earl of Marlborough on similar charges; the dismissal somewhat diminished her popularity and harmed her relationship with her sister Anne who was strongly influenced by Churchill's wife, Sarah.Anne appeared at court with Sarah, obviously supporting the disgraced Churchill, which led to Mary angrily demanding that Anne dismiss Sarah and vacate her lodgings. Mary later failed to visit Anne during her pregnancy and relations remained strained until Mary's death. William had crushed the Irish Jacobites by 1692, but he continued with campaigns abroad in order to wage war against France in the Netherlands. In general, William was away from the spring until the autumn of each year. When her husband was away, Mary acted in her own name but on his advice; while he was in England, Mary completely refrained from interfering in political matters, as had been agreed in the Bill of Rights. She did, however, participate in the affairs of the Church—all matters of ecclesiastical patronage passed through her hands. She died of smallpox at Kensington Palace on December 28, 1694 and was buried at Westminster Abbey. Upon her death, baroque composer Henry Purcell of England was commissioned to write her funeral music, entitled Music for the Funeral of Queen Mary. The ominous March (catalogued as Z860 A) has subsequently been used in other media, such as the title theme in the movie A Clockwork Orange. William, who had grown increasingly to rely on Mary, was devastated by her death, and reportedly said that "from being the happiest" he was "now going to be the miserablest creature on earth." After Mary II's death, William III continued to rule as king. Princess Anne's last surviving child, William, Duke of Gloucester, died in July 1700, and, as it was clear that William III would have no more children, Parliament passed the Act of Settlement 1701, which provided that the Crown would go to the nearest Protestant relative, Sophia, Electress of Hanover and her Protestant heirs. When William III died in 1702, he was succeeded by Anne, and she in turn was succeeded by the son of the deceased Electress Sophia, George I.
Mary endowed the College of William and Mary (in the present day Williamsburg, Virginia) in 1693. She also founded the Royal Hospital for Seamen in Greenwich. The joint style of William III and Mary II was "William and Mary, by the Grace of God, King and Queen of England, France and Ireland, Defenders of the Faith, etc." when they ascended the Throne. The claim to France was only nominal, and had been asserted by every English King since Edward III, regardless of the amount of French territory actually controlled. From April 11, 1689—when the Estates of Scotland recognized them as sovereigns—the royal couple used the style "William and Mary, by the Grace of God, King and Queen of England, Scotland, France and Ireland, Defenders of the Faith, etc." ↑ English Monarchs, The House Of Stuart: William III and Mary II. Retrieved August 21, 2007. ↑ Ford, David Nash, Anne Hyde. Retrieved August 21, 2007. ↑ English Monarchs, The House Of Stuart: James II and VII. Retrieved August 21, 2007. ↑ The Jacobite Heritage, James II and VII. Retrieved August 21, 2007. ↑ Pollock, John, The Policy of Charles II and James II. (1667-87.). Retrieved August 21, 2007. ↑ Seager, Nicholas, “Reign of King William III.” The Literary Encyclopedia. The Literary Dictionary Company. Reign of King William III. Retrieved August 21, 2007. ↑ Encyclopedia Britannica Mary II (London: Cambridge University, 1911. ); Seager, Nicholas, “Reign of King William III.” The Literary Encyclopedia. The Literary Dictionary Company. Reign of King William III. Retrieved August 21, 2007; English Monarchs, The House Of Stuart: William III and Mary II. Retrieved August 21, 2007. ↑ The Jacobite Heritage, Enquiry of the Princess of Orange into the Birth of the Prince of Wales. Retrieved August 21, 2007. ↑ Wilkes Jr., Donald E., and Kramer, Matthew, The Glorious Revolution of 1688: Chronology. Retrieved August 21, 2007. ↑ English Monarchs, The House Of Stuart: William III and Mary II. Retrieved August 22, 2007. ↑ History of the Monarchy, James II. Retrieved August 22, 2007. ↑ History of Parliament Trust, ”King James' Parliament: The Succession of William and Mary.” The History and Proceedings of the House of Commons: Volume 2. (British History Online, 1742) p. 255-277. ↑ History of Parliament Trust, ”King James' Parliament: The Succession of William and Mary.” The History and Proceedings of the House of Commons: Volume 2. (British History Online, 1742) p. 255-277; History of the Monarchy, William III and Mary II. Retrieved August 22, 2007. ↑ History of the Monarchy, William III and Mary II. Retrieved August 22, 2007. ↑ Encyclopedia Britannica Online, William Sancroft. Retrieved August 22, 2007; Historic-UK.com, Historic England - Archbishops of Canterbury. Retrieved August 22, 2007. ↑ Encyclopedia Britannica Online, John Graham of Claverhouse, 1st viscount of Dundee. Retrieved August 22, 2007; The Contemplator, The Contemplator's Short History of "Bonnie Dundee" John Graham, Earl of Claverhouse, Viscount of Dundee. Retrieved August 22, 2007. ↑ Constitution Society, Bill of Rights. Retrieved August 22, 2007. ↑ Encyclopedia Britannica Mary II (London: Cambridge University, 1911. ); Constitution Society, Bill of Rights. Retrieved August 22, 2007. ↑ NNDB, Gilbert Burnet. Retrieved August 22, 2007. ↑ Encyclopedia Britannica Mary II (London: Cambridge University, 1911. ); BBC, Historic Figures: Mary II of Orange (1662 - 1694). Retrieved August 22, 2007. ↑ The Public Library of Cincinnati and Hamiliton County, Music for Queen Mary. Retrieved August 22, 2007. ↑ English Monarchs, The House Of Stuart: Queen Anne. Retrieved August 22, 2007. ↑ William and Mary College, Historical Facts. Retrieved August 22, 2007. 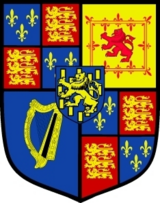 ↑ Fleur-de-lis Designs, Royal Coats of Arms: England & France. Retrieved August 22, 2007. History of "Mary II of England"
This page was last modified on 2 April 2008, at 11:52.